That's a no no from the KoKo! Khloe Kardashian, like her sister Kim Kardashian, was more than miffed with Adrienne Bailon's comments about their younger brother Rob—even airing her grievances via Twitter on Wednesday, July 30. Khloe, 30, first re-tweeted Kim's comments on the social media site, which read: "So sad when people try to kick my brother when he is down #FamilyForever… Funny how she says being with a Kardashian hurt her career yet the only reason she has this article is bc she is talking about a Kardashian." See Kim's full Twitter defense here. 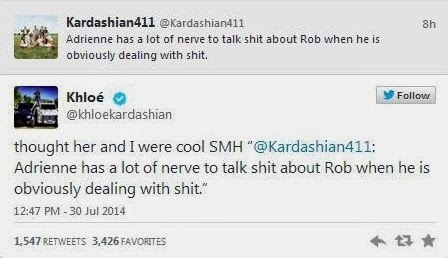 "Thought her and I were cool SMH," Khloe wrote, retweeting a fan who commented: "Adrienne has a lot of nerve to talk s--- about Rob when he is obviously dealing with s---." "Don't think it was a secret. For sure. Don't kick my brother while he's down." 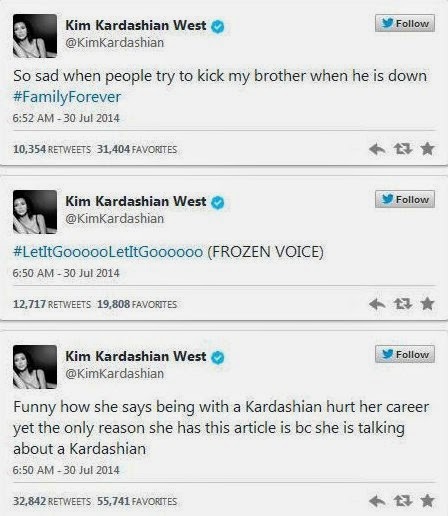 The Kardashian family's public defense of Rob comes one day after the reveal of Bailon's no-holds-barred interview in the September 2014 issue of Latina magazine. In the piece, the former Disney Channel star slammed her ex Rob for cheating on her, and said briefly starring on Keeping Up With the Kardashians actually worked against her in the long run. "To be stuck with that Kardashian label, that was so hurtful to me and to my career," Bailon said, adding of Kris Jenner's youngest son: "He strategically planned things out so that he could cheat on me, and that to me was so disloyal."